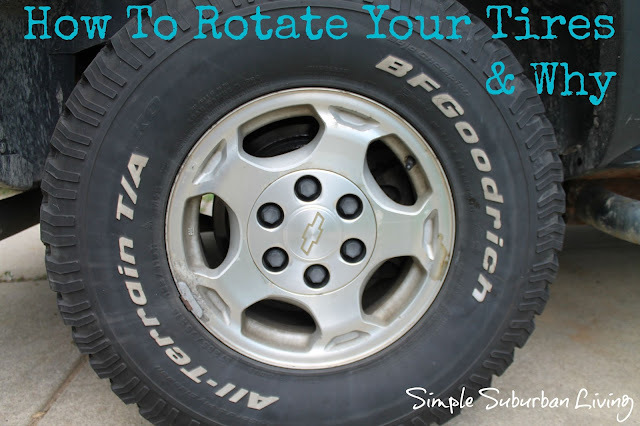 Can you rotate your own tires? How often should you rotate your tires? These are some of the common questions out there surrounding this very simple process. You should be rotating your own tires unless your tire shop does it for free with the purchase of your new tires. This is a very easy process that should be done along with oil changes or at least every 5,000 miles or so. Step 1: Using an impact wrench, 4-way, or tire iron loosen all of the lug nuts on all four tires. Do not take them all the way off yet! Step2: Safely jack up the front or rear of your vehicle and use jack stands to support both wheel off the ground. remember to use jack and jack stands only on solid frame on the underside of the vehicle. Also place wheel blocks under one of the tires and make sure you are on a flat surface and the vehicle is in park. Move your jack around to one of the opposite wheels from where you placed your jack stands and then lift the wheel off the ground. you should only be lifting the wheels off the ground just enough to slide your hand underneath the wheel. You should now have 3 wheels off the ground and one wheel on the ground with blocks in front and rear of the tire. Step 3: Remove the 3 wheels that are off the ground and place them in the position that they will go next. More on that in the next step. Step 4: Tire rotation for front wheel drive vehicles - the two front tires will go directly to the same side in the back. The back tire on the right will go to the front left and the back tire on the left will go to the front right. Rear wheel drive vehicles - Both rear tires will go to the front on the same side. front left will go to rear right and front right will go to rear left. Step 5: Rotate the tires according to the pattern in step 4 for the three wheel that you have off. Then lower the jack and move it to the other side, lift the vehicle and switch the remaining tire. Step 6: With all tires securely in place, lower the vehicle to the ground fully. Next, tighten all of the lug nuts fully now that the tires are on the ground and will not spin. Step 7: Take your vehicle for a test drive. You may hear some mild humming or it might "fell" a little different for a couple of weeks especially if you have waited too long between rotations.